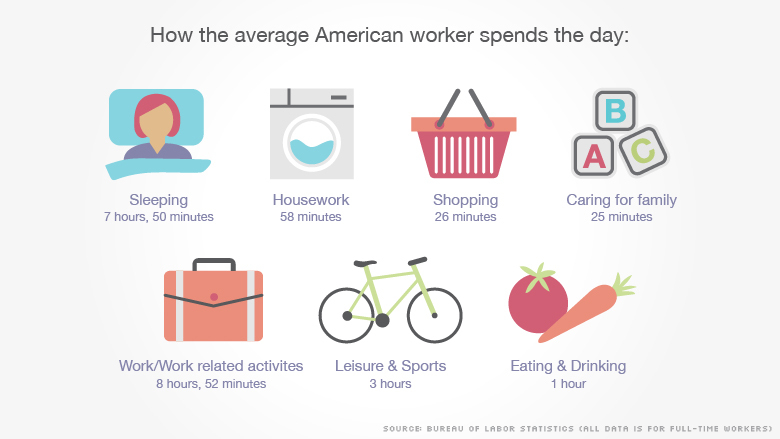 Americans spent more time working last year, but the good news is we're getting more sleep too. The average workday clocked in at seven hours and 48 minutes last year, according to the American Time Use Survey for 2014 from the Bureau of Labor Statistics, 12 minutes more than in 2013. Workers with regular full-time jobs spent even more time on the job -- an average of eight hours and 11 minutes. But that doesn't mean it's always behind a desk at the office. More Americans are working from home, with 23% completing all or some of their work from home. That number was 19% in 2003. Working from home can include a few minutes spent checking work e-mails or a full day of working remotely. Self-employed people were more likely to work from home and on the weekends. Among full-time workers, men spend more time on the job than women, working an extra 37 minutes a day. More good news: Time spent on housework is declining. Women with full-time jobs spend 25 minutes more per day on household activities than men. But men are stepping it up in the kitchen. The number of all men doing the cooking and food cleanup last year increased to 43% from 35% in 2003. During the same period, the share of women doing housework dropped to 49% from 54%, according to the report. Men watch more TV then women, and everyone is spending more time sleeping. Americans aged 15 and up spent an average of eight hours and 48 minutes sleeping last year, four minutes more than in 2013. 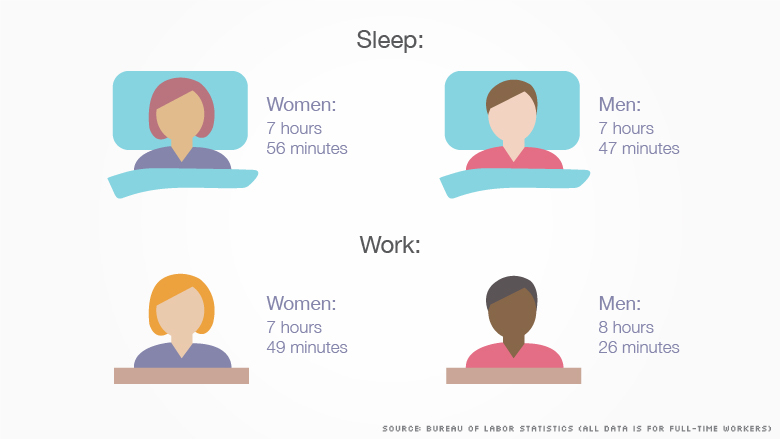 Those with full-time jobs got a little less sleep -- seven hours and 50 minutes. When it comes to leisure time, most of it was spent in front of the television. Americans spent an average of 2 hours and 49 minutes a day in front of the tube last year, a three minute increase from 2013. But time spent on the couch varied by gender, and employment status. Men watch 26 more minutes of television than women, while full-time workers only spent one hour and 35 minutes watching TV. The Labor Department surveyed around 11,600 people over the age 15.